Borrowing an idea from Sam in Montchauvet, France, I took a picture out my window. (Unlike Sam, I didn't have a bird as a focal point!) 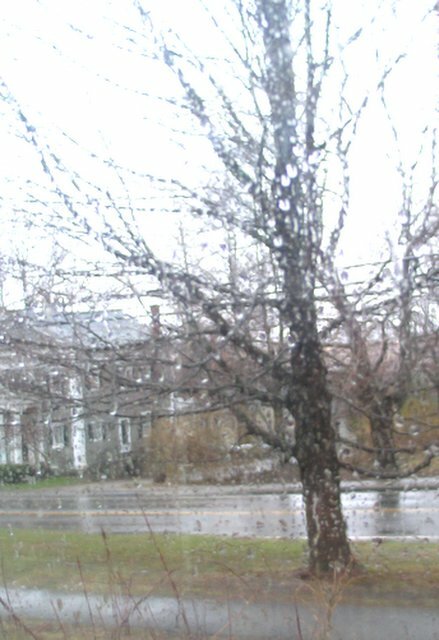 It's rainy but still unseasonably warm - we could easily have gotten a foot of snow in early April. Your comments are vanishing - I had to highlight them to read and to find the link to make a comment. It happens to a few blogs, but I don't know what the bug is, and if it comes from this blog model or not? Cats and dogs. The photographers' doom. Don´t worry rain is beautiful in your picture. Lovely kids you got there. Welcome to the DP Group! It was raining here in Virginia last night as well, but all is sunny here again. Wish the same to you! Been raining here too. And tomorrow we might have snow too.